Switzerland is a very special country with many features, like chocolate. Do you like chocolate? I do. But do you know what country produces the most chocolate? Can anyone guess? It's Switzerland. 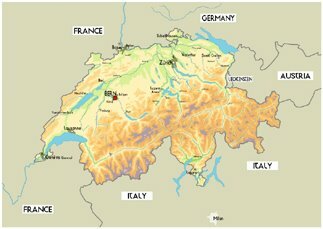 You all know that Switzerland is a very mountainous country and I do not think that very many cocoa trees could grow there. Honestly, I do not know how they make their chocolate so well, but I love it. In fact, chocolate lovers around the world order Swiss chocolate for special occasions or even to just to lie around in their fridge. There is one downside about this delicious treat. It is expensive. But if you go to any wedding or something like that, you will probably find that kind of chocolate, so eat all you can. Chocolate is not the only thing that makes Switzerland such a special country. In Geneva, there are more banks within the metropolitan area of the city than any other city in the world. Switzerland is where many millionaires deposit their money to keep it safe because Swiss banks are high-security so they can not be robbed. "But if you go to any wedding or something like that, you will probably find that kind of chocolate, so eat all you can." Heheheee! Yeah, that's not a problem! I LOVE chocolate!